It is unusual for there to be two posts on the same day, but it is occurring today for a very special reason. In my original musings, I thought that the structure had replaced a shop, but was informed by reader Peter that that was not the case. A couple of readers let us know that the building was formerly a bank, but I had been unable to dig up any further particulars. And then... I opened my email this morning to find that a very thoughtful reader had done her own research on the building and kindly supplied the following information for us all to share. Thank you Kerry - I am exceptionally grateful! Kerry wrote that she used to catch a bus from right outside this building, and that she was sure that it had been a Bank of New South Wales. So, she contacted the bank (now Westpac) and received a reply from their Historical Services section that confirmed her thoughts. Bless them (and Kerry), they even supplied background information and some photos. The original South Brisbane branch of the Bank of NSW opened in Stanley St on 3rd April 1877. 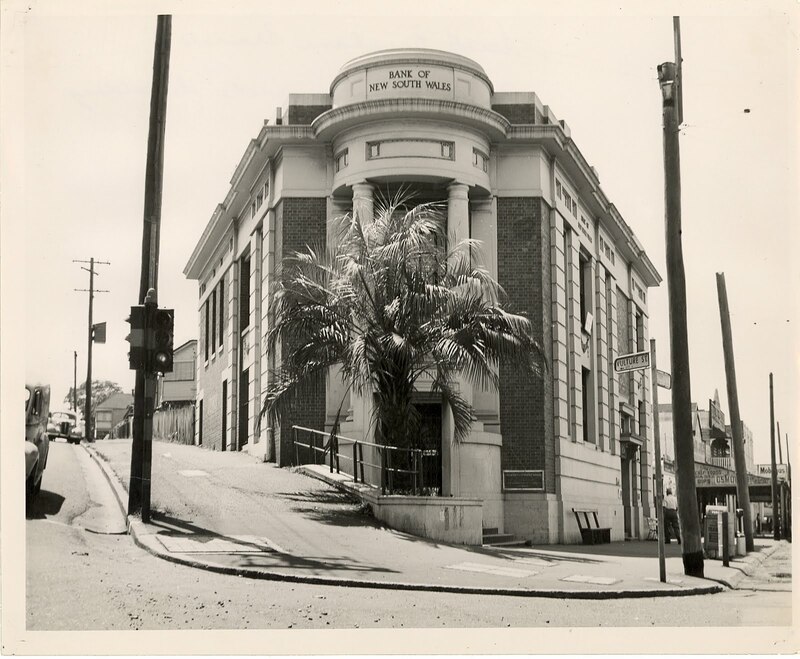 It was the second branch of the bank to be opened in Brisbane (the first was on the corner of George and Queen Sts in Brisbane Town); and it was a simple timber and iron structure. In 1894, the land on the corner of Vulture St and Stanley St was purchased for £1250. The site had previously been a horse sale-yard. Then the bank erected this building in 1921 at a cost of £8720/7/4. Here it is, as photographed shortly after opening. 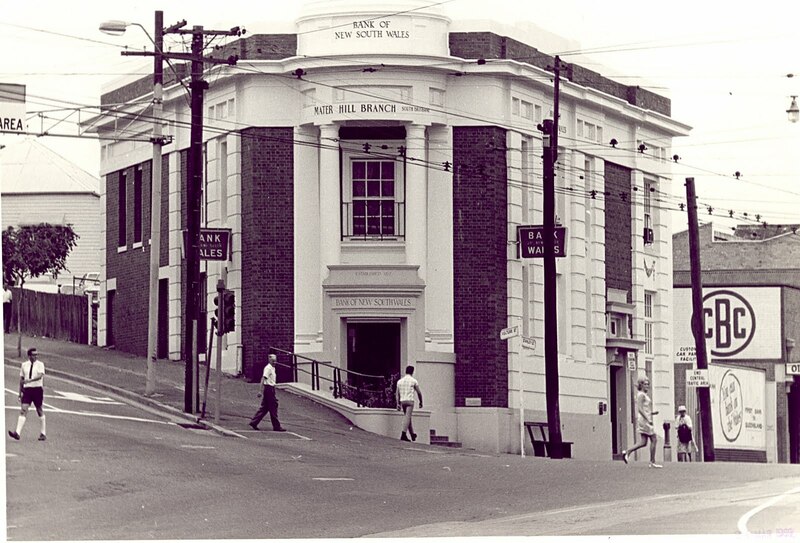 And here are a couple of other photographs of this lovely building - the first from 1939, and the second from 1969, by which time it had been renamed as the Mater Hill Branch of the bank, following the establishment of a nearby post office with that name. I can't begin to tell you how thrilled I am at this community action. Firstly, for someone to understand that there was an error and to take the time to let me know so that it could be corrected. Then for another reader with some different knowledge to go to the trouble of seeking confirmation of her thoughts, and then emailing me so that all readers could share. Not to mention the staff at Westpac who generously supplied the historical information. As a family historian myself, I just love stories like this. It warms my heart to think that corporations like Westpac still value their historical past and that people care enough to find out about it! 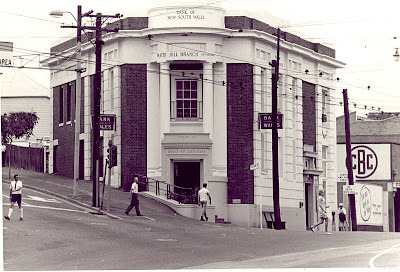 there used to be a National Bank branch, maybe also National Australia Bank at Mater Hill. it was at the junction of Annerley rd and Stanley st.
Brissiemum2: Yes, hooray for Westpac! Not only to have kept this historical data, but for being willing to share it. Thank you for this information. I have recently discovered that my great, great grandparents were married in this building on 12 April 1895 (Thomas Ross - Amy Elizabeth Davidson). The brother of the bride, James, was in fact branch manager and his son was, in turn, Sir Alfred Charles Davidson - Gen Manager of the Bank of NSW. Amy's father was also another Brisbane notable - Alfred Davidson - on whom wikipedia has more. Sadly, I'm down the Ross line and not quite as glorious but we still have our moments. 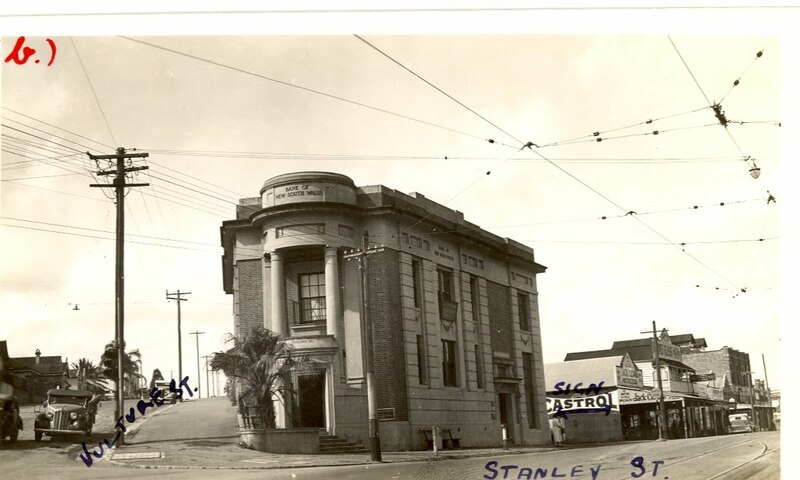 My name is Terry Poole and I worked in the building on the corner of Vulture and Stanley streets in 1974 when it was still owned by the Bank of New South Wales. It had an enormous steel safe inside (almost floor to ceiling as I recall) but it was very small - probably why it ceased to be a bank. I have just read this article and can add that a Doctor Dique (I think the spelling is correct) had his surgery office in this building. This was around 1966 from memory. the entry was through the corner entrance and I remember the waiting room was very small and the doctor very old.